This is a great match game to play at centers. This game will help students learn their math facts in a fun way. Additon problems from 1-9 are included in color and in black and white outline. There is also a blank copy available.There are 63 pages. Print only what you need. Directions: Print on cardstock for durability. cut and laminate. You can divide these into small groups depending on the addition problems you would like your students to practice. A set of 10 would be perfect. These can be placed in zip lock baggies for easy storage. 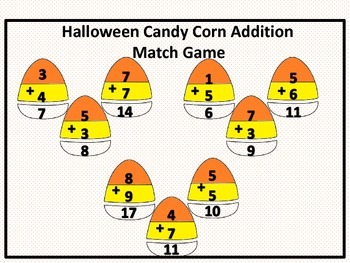 Have your students play the game by matching the answer to the problem by connecting the missing piece to the candy corn.